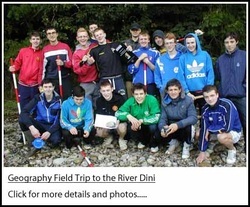 Sixth Year Students from Mr. Dwyer's and Ms. Meaney's classes travelled to the River Dini at Ballyrafton Wood to do their Geography Field Study on Wed 18th September. This year's river fieldwork investigation is entitled A STUDY OF THE GEOMORPHIC PROCESSES OF TRANSPORTATION AND DEPOSITION IN A FLUVIAL ENVIRONMENT. The report must be completed and handed up before Friday 11th April 2014. The project is worth 100 marks (or 20%) of Leaving Certificate Geography total of 500 marks.